Please submit your responses prior to February 24, 2006.
met the transportation requirements of many isolated island residents. 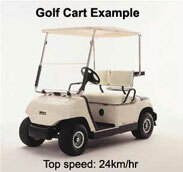 typically fall under a regulated, but not posted, speed limit of 50 km/hr. 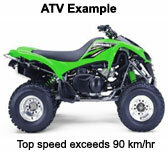 exceed speeds of 90 km/hr. would require a regulatory amendment. What became of the Dogwood? In December 2001, B.C. Ferries released the “Wright Report” which was prepared by Fred R. Wright, an independent financial consultant. In his report, he analyzed the governance structure, operating framework, historical financial performance and the current 15-year plan of B.C. Ferries. The report is designed to provide guidance to the Provincial government regarding the future operation and structure of B.C. Ferries. 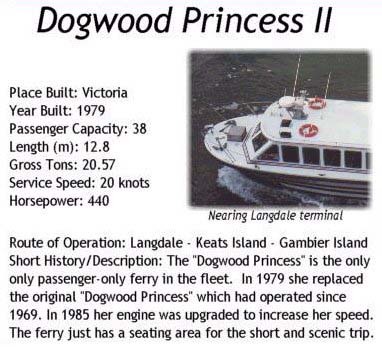 Our major concern regarding this process is the viability of the Dogwood ferry that serves Gambier and Keats Islands. Particularly those who live on the islands on a full time basis are quite vulnerable to changes in service but all of us at some times and in some ways have needs that are tied to adequate and reliable ferry service. The viability of the minor ferry system is one of the major issues in this report and, coming from a business model, its recommendations tend to examine the specific financial viability of these services rather than looking at the financial functioning of the whole system. In the following articles, the Islands Trust responds to the outlook and recommendations of this report. We strongly recommend that you study these responses and consider how we as a community or as individuals can respond to support Islands Trust in their efforts on our behalf to protect our ferry service. 1. Record of issues made regarding the Wright Report by Islands Trust personnel speaking with Hon. Judith Reid, Minister of Transportation. 2. A detailed examination by Islands Trust personnel of issues raised by the Wright Report. 3. A summary of the issues raised in Section 2. These documents are stored in Adobe's portable document format (PDF). To view and print them, you will need Acrobat Reader. Click on the name of a form to download it. Some browsers will automatically open the file for you, but others will require you to save it on your computer first. To do this, right click on the link and select "save target as..." If you need to download Adobe Acrobat Reader, click the icon below.